The elevator! That's right, devoted fans of The Big Bang Theory, that familiar never-working elevator so frequently viewed in the show makes its appearance on this sensational journal. The journal front cover shows the elevator doors, caution tape, and the "Out of Order" sign, while the back of the book presents a view looking up the stairway. 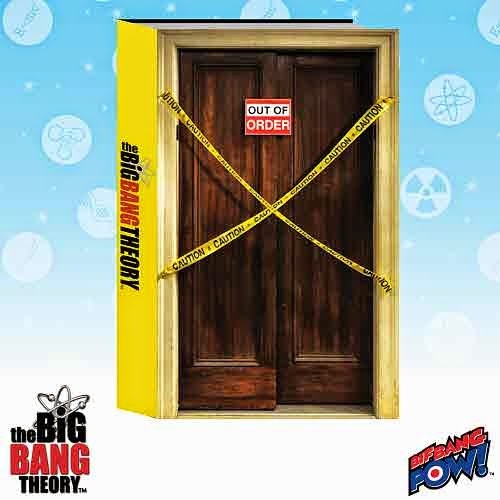 The The Big Bang Theory logo is included on the binding and back. Measuring 8-inches tall x 5-inches wide, the unique journal contains 320 lined pages. Finally, a quick and easy place to jot down your brainy ideas! Thank you, Bif Bang Pow!. In The Big Bang Theory, Leonard and Sheldon are brilliant physicists – geniuses in the laboratory, but socially challenged in the real world. Enter beautiful, street-smart neighbor, Penny who aims to teach them a thing or two about life. Despite their on-again, off-again relationship in the past, Leonard believes he’s found true love with Penny. Even Sheldon has found a female companion – entering into a “Relationship Agreement” with neurobiologist Amy Farrah Fowler. In their free time, Leonard and Sheldon continue to enjoy frequent trips to the comic book store and fantasy role-playing games with their ever-expanding universe of friends, including fellow scientists Raj and Howard, and Howard's adorable microbiologist wife, Bernadette. 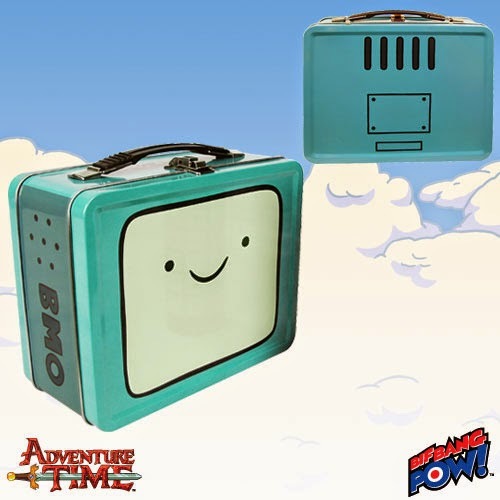 Who can forget adorable video game console BMO (Beemo) from Cartoon Network's Adventure Time animated TV series? Not Bif Bang Pow!, that's for sure! Introducing our Adventure Time Tin Tote, tailor made for the show's legions of admirers. Features gorgeous 4-color Adventure Time-themed artwork spotlighting BMO. What time is it? It's time to order yours before they're all gone! Bif Bang Pow! 's awesome Adventure Time Tin Tote is just about everything Finn and Jake fan could ask for. The colorful tin tote measures 8 5/8-inch wide x 7-inch tall x 4-inch deep and features BMO's friendly face on the front with his back on the reverse side. Ages 14 and up. Adventure Time introduces viewers to unlikely heroes Finn and Jake, buddies who traverse the mystical Land of Ooo and encounter its colorful inhabitants. The best of friends, our heroes always find themselves in the middle of heart-pounding escapades. Finn, a silly kid with an awesome hat and Jake, a brassy dog with a big kind heart, depend on each other through thick and thin. Play rock-paper-scissors-lizard-Spock with your buds - like Sheldon, Leonard, Howard, Penny, and the gang - or just sit calmly in your little nook, curled up with this The Big Bang Theory Rock Paper Scissors Spock Journal. With 320 lined white pages inside, the hardbound book measures approximately 8-inches tall x 5-inches wide on the outside. There's plenty of space to record your most cogent thoughts and brilliant ideas! 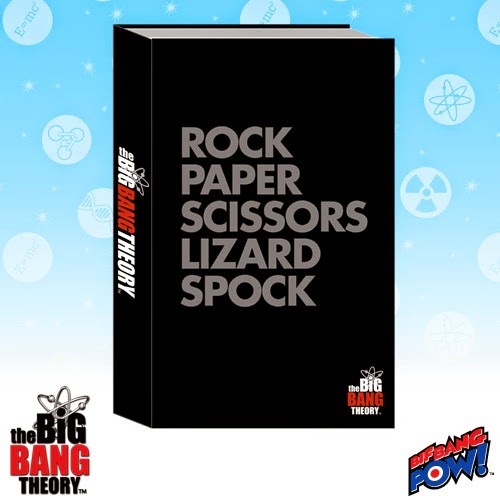 The cover is black, with the words "Rock Paper Scissors Lizard Spock" in grey, while the spine features The Big Bang Theory logo in red, white, and black. Naturally, the back cover sports scientific symbols and a black-and-grey motif. Ready? One, two, three! Ages 14 and up.